In our urban neighborhoods a wild garden is often times taken as an unkempt garden. The neighbors that admire their wide expanse of green lawn on the weekdays, and work on it all weekend, will not appreciate the wild patch you have started for the butterflies, or the brush pile for the snakes. Beauty is in the eye of the beholder you say? Well, when in Rome.... Here are some tips to help you get along with, and maybe change the mind of your environmentally unfriendly neighbors. Keep the areas around the naturalized area mowed. This will show the neighbors that you are taking care of the place and not just letting it go. Framing the areas with mowed paths and borders will give a neat appearance that the neighbors can relate to. Trim the plantings in front of the house. Many people feel that a house that cannot be seen because of overgrown shrubbery is neglected. You don't have to spend the weekends making topiaries, but a little trimming will help with the public relations. Use colorful plants and flowers. Give the neighbors something to ooh and ah over. Plant wildflowers that are bright and beautiful. Even lawn lovers can appreciate colorful flowers. Use landscape borders. 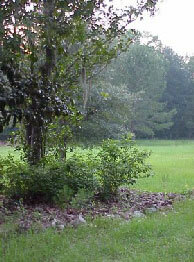 Use rocks, landscape timbers, railroad ties, or whatever is available to make borders and beds. Borders give the appearance of the area having received a gardener's attention. Use lawn ornaments and/or benches. A bench in the center of the butterfly garden gives it a homey and much used look. Don't forget ornaments. A sun dial is always nice to look at. Remember you want the natural look, not the neglected look. All material on this site © Hernando Chapter of the FNPS. The materials on this website may be copied and distributed without permission, provided that they are used for non-commercial, informational or educational purposes, and you acknowledge this site and the Hernando Chapter of the Florida Native Plant Society as the source of publication.